Types of Complete Implant Dentures - Santo Domingo, Dominican Republic - Dental Implants Dominican Republic S.Q.D. Types of Complete Implant Dentures - Santo Domingo, Dominican Republic - Dental Implants Dominican Republic S.Q.D. There are two types of complete denture prostheses: removable and fixed. Both can be used to replace a complete set of teeth. Removable means you`ll be able to take it out of your mouth. Fixed means it can only be taken out by a dentist. You and your restorative dentist can discuss which type is best for you. 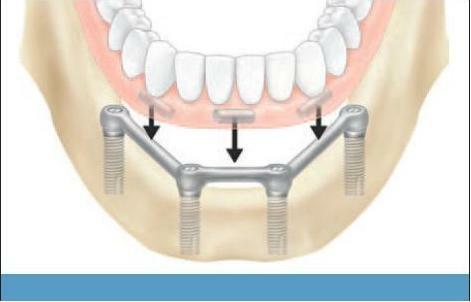 With a fixed prosthesis, the new teeth are fitted to a frame that is secured to the implants. 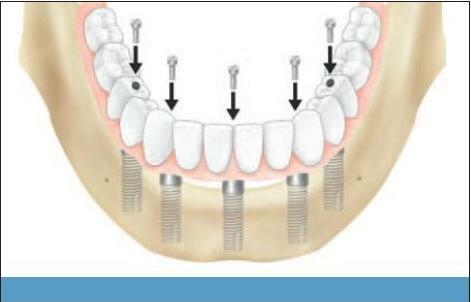 Five or more implants are placed along the contour of the jaw. In some cases, a fixed prosthesis offers more stability for chewing.